The "Day of the Dead" is an important day of remembrance and celebration in Peru, Mexico, and other Latin American countries. It is represented here with a somewhat gruesome Nicho (niche) from Peru. But death should not have the last word. Carrillo's Nativity representation, in a Nicho, too, tells us that in the Christian tradition victory over death comes with the Incarnation and triumphs with Christ's Resurrection. 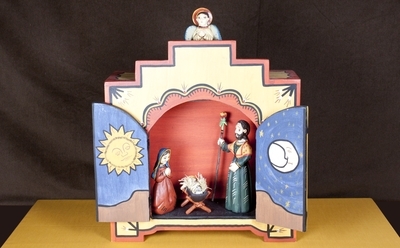 Wood and resin nativity scene depicting the nativity of Jesus, sculpted, carved and painted by Charlie Carrillo in New Mexico. The exact date of creation is unknown. Exhibition label originally written by Fr. Johann G. Roten, S.M. for exhibit entitled "At The Manger" and held at Roesch Library, University of Dayton.